The winner's stall at The Valley is usually reserved for unbridled celebration but there was a genuinely sombre tone on Saturday following the win of Craig Williams aboard Magic Consol in the Travis Harrison Cup. It was 22 years ago that Harrison - a cousin and close friend of Williams - died in a car accident, and numerous members of his family came together for the memorial race. It was always going to be a little emotional but when Williams brought the horse back to the winner's stall, the tears started to flow. 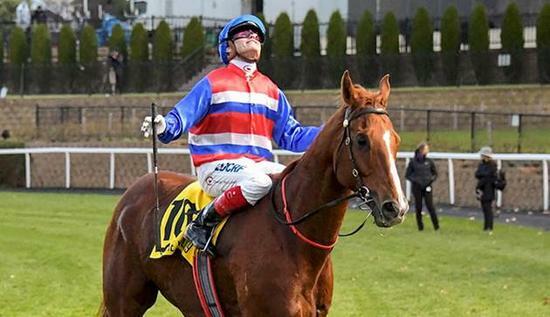 "He was an outstanding person and outstanding jockey," Williams said of Harrison. "He meant so much to so many people." Williams had never won the race named after his cousin but was nosed out last year on Magic Consol and was determined that this year he would land the winner of the race. "I rang (trainer) Paul Preusker for the ride because I knew the horse was going really well and you just saw how well," the jockey said. "I want to congratulate Moonee Valley for keeping this race going. It always brings back fantastic memories of Travis." Punters also fancied the horse, backing him in from $6.50 to start the $4 favourite. They had a few worries as Williams was patient back near the tail but then Magic Consol made a blistering run around the field to grab the lead on the corner and then run clear to win by seven lengths.